Join us for this journey in celebration of our American family-owned business that has grown to be a leader in the construction and landscape industry since 1946. Click on our timeline below to see highlights from County Materials’ history. We also showcase our anniversary video to recognize our past, present and future. Our story dates back to 1946. Following World War II, the family owned business was hauling sand and gravel to area farm and residential jobs, and started manufacturing concrete block for area farmers and contractors with a single machine in Marathon, Wis. Into the 60’s, the company continues to upgrade its block manufacturing production by adding automatic batching and cement silos, and expanding into more product lines. In 1967 the business was renamed and incorporated as County Concrete Corp.
As construction needs grew, so did County Materials — upgrading manufacturing equipment and expanding into more product lines. This included constructing ready mix concrete plants and adding aggregate quarries. The first precast concrete products were also manufactured in the 1970s. In 1981 the company manufactured it’s first concrete pipe and manhole products. In 1987 the company made a major move by establishing a concrete pipe operation near Orlando, FL. In the 90s the company forms a Prestress, Precast and Pipe Division that expands into larger commercial markets. 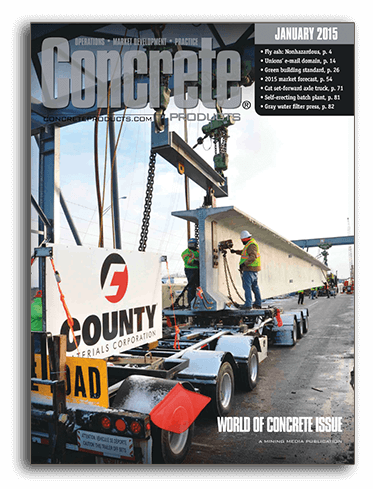 In 97, County Concrete earns a Harry H. Edwards Industry Advancement Award for innovations in precast technology used to manufacture concrete segments to construct a 1 million sq. ft. underground library archive at the University of Minnesota. In 2003, the company is renamed County Materials Corporation and continues it’s advancement with numerous acquisitions and plant openings in Wisconsin, Illinois, Iowa and Indiana. In 2003, County Materials supplies 21,000 concrete tunnel segments and more than 200 arched wall and ceiling panels for the Hiawatha Light Rail Tunnel in Minneapolis/St. Paul, MN. The project earns the company our second Harry H. Edwards Industry Advancement Achievement Award. In 2013, County Materials completed construction of our production facility in Janesville, WI enabling us to enhance production capabilities for landscape and masonry products with superior quality and high-end, sought-after aesthetics not readily available elsewhere in North America. In 2015, County Materials receives industry recognition for manufacturing massive high performance bridge beams in our state-of-the-art plant in Janesville, WI. August 6, 2018 — County Materials acquires the precast manufacturing facility owned by Sanders Companies in Whitestown, IN. The acquisition positions County Materials for long-term growth and market leadership in precast products throughout the Midwest by adding manufacturing capabilities in structural precast products, including box culverts, three-sided bridge structures, and a new product line - insulated sandwich walls. The structural, load-bearing, insulated precast building envelope system is used predominantly to construct large commercial and industrial buildings. While many things have changed through the years, working hard, taking pride in the results, building relationships, and earning the trust of employees and customers continue to form the cornerstone of how County Materials operates.